Rising rates of obesity worldwide have been linked to the growing consumption of energy-dense foods, many of which are increasingly nutrient poor as refined grains, added sugars, and added fats have become the staple foods of today’s most families’ diet in western countries (WHO, 2016; DGS, 2017). At the same path the prevalence of nutrition related diseases have become higher and higher. Recent studies, however, point out a secret weapon to make up for our food excesses: The Mediterranean diet, the UNESCO’s intangible heritage. Health promoting campaigns are failing to reduce obesity in adolescents. Obesity is now considered one of the most serious public health challenges of the 21st century. 1 in 3 adolescents is estimated to be obese in Europe, being the highest rates found in Southern and Mediterranean countries (Cash, 2017; WHO, 2016) . 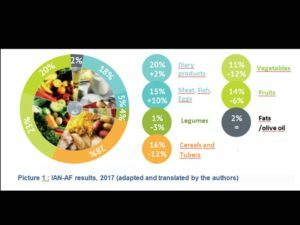 Furthermore, in Portugal, the results of the 2nd National Food and Physical Activity Survey (IAN-AF) presented in 2017, provided accurate data on the Nutritional Status of the Portuguese Population. Besides confirming similar data about obesity, also show other disturbing results: 1 in 2 Portuguese do not consume the amount of fruit and vegetables recommended by the World Health Organization (WHO); Approximately 1.5 million Portuguese (17% of the population) consume at least one refrigerant or nectars per day, of which 12% are refrigerants; The national prevalence of ‘regular’ physical activity and / or programmed leisure activity is 41.8%. On the other hand food / diet patterns have been changing and the Mediterranean diet has been replaced or at least compromised by the so-called American diet or by junk food. At the same time, however, in the last decades, the Mediterranean diet has been recognized as a nutritional model to be followed either for being healthier than other diets or for being environmentally friendly. The Med diet results from millennial history of the peoples of the Mediterranean basin – Hebrews, Phoenicians, Greeks, Carthaginians, Romans, Germanics, Arabs, Byzantines, Ottomans, Spanish, Portuguese… – reflecting their traditions, religious, cultural and technological differences. As a nutritional model it promotes a pattern based on diversity, local and seasonal products. Globally, according to Walter Willett (the 90s), it is a plant-based pattern, where vegetables, fruits, cereals (whole grain) legumes and nuts are regularly consumed. Followed by fish (blue fish , especially)and few portions of white meat, eggs, diary products (low fat cheese and yogurts). Red meat and processed meals, saturated fat and sugars should be avoided in a regular basis .Water is the basic beverage although, for adults, red wine (in moderation) , herbs (parsley, rosemary, coriander ….) as salt substitute. 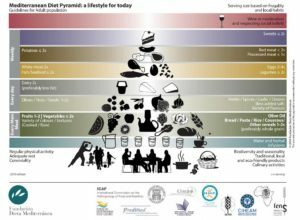 In 2010, a new Mediterranean diet pyramid was developed at the Eighth International Congress on the Mediterranean diet, held in Spain (BachFaig et al., 2011; Dernini et al., 2012). This contrasts both with the American diet ( rich in red meat, dairy products, processed and artificially sweetened foods, and salt, with minimal intake of fruits, vegetables, fish, legumes, and whole grains) and junk food (highly caloric , salty and saturated fat )(Bloomfield et al., 2015). Since the pioneer Seven Countries Study (Ancel Keys, 1950-1975), the health benefits of the Mediterranean diet and its effects against chronic diseases have been established. A large percentage of total fat in the Mediterranean diet is from monounsaturated fat, which is largely responsible for the reduction in heart disease because it does not raise cholesterol levels the way saturated and trans fats do. Other benefits on the Mediterranean diet include the high concentration of cancer-fighting antioxidants because of the emphasis on fruit and vegetables, promotion of regular physical activity to maintain a healthy weight and lower sodium intake due to the reduction of processed foods. high intakes of foods typical of the traditional Mediterranean dietary pattern – i.e. fruit, vegetables, whole grains, olive oil and fish – were associated with a reduced risk of developing various types of cancers (Bosetti, Pelucchi & La Vecchia, 2009; Vernele et al., 2010). On the other hand, being grown locally, long-distance transportation is reduced. Moreover, “Mediterranean-Diet foods are adapted to the climatic and geographical conditions of the region in which they grow, reducing the need for extensive watering, fertilizing and pesticide use. For example, olive trees grow best in hot sun and dry soils” (Mortimor, 2016; Martínez-González et al., 2017). Although not being a top secret weapon, literature seem to prove that Med Diet is nutritionally healthier and more environmentally-friendly, making up for our excesses.